Our Help Forum and office hours hangouts have also been a place for helpful, insightful, and sometimes controversial discussions. It's not always easy to find ways to improve websites, or to solve technical & usability issues that users post about, so we're extremely thankful to have such a fantastic group of Top Contributors that give advice and provide feedback there. Where are we headed in 2014? Only time will tell, but I'm sure we'll see more information for the general webmaster, hard-core technical advice, ways to make mobile sites even better, rockin' Webmaster Tools updates, tips on securing your site & its connections, and more. Are you ready? Don't forget your towel & let's go! On behalf of all the webmaster help forum guides, we wish you happy holidays & a great 2014. It's been a busy year here on the blog. We hope that our posts here have helped to make these - sometimes complex - topics a bit easier to understand. Is there anything you would have wanted more information about? Let us know in the comments! for Google services. In the spirit of keeping things simple and focusing our efforts, we've decided to deprecate the old verification API method on March 31st, 2014. The rest of the API will remain unchanged, this only affects the verification method. For more information about verification in general, please see our site verification Help Center article. Download the Google API client library for your favorite programming language. Learn about the Site Verification API and its methods. Allow your users to authenticate with OAuth. We hope this API will make it easier to implement Google site verification in your projects. Should you have any questions, feel free to comment here, or post in our Webmaster Help Forum. 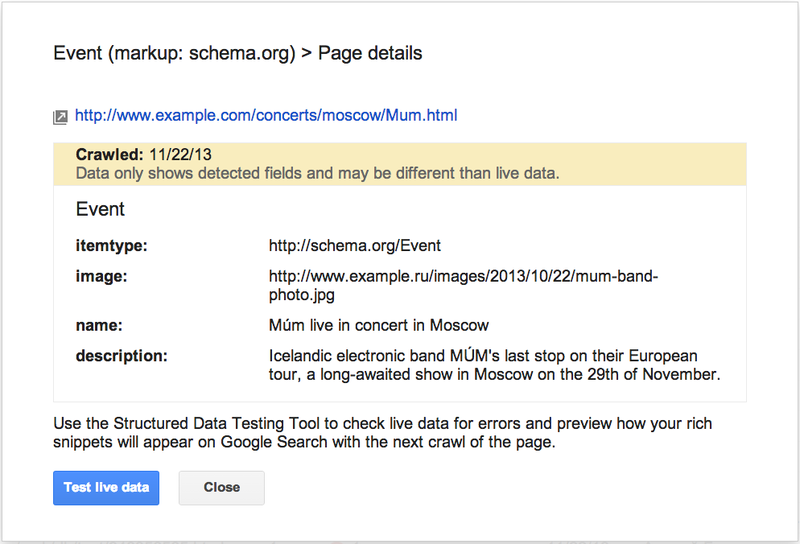 Just over a year ago we introduced a new API for website verification for Google services. In the spirit of keeping things simple and focusing our efforts, we've decided to deprecate the old verification API method on March 31st, 2014. The rest of the API will remain unchanged, this only affects the verification method. For more information about verification in general, please see our site verification Help Center article. This tool is useful for removals on other peoples' websites. You could use this tool if a page has been removed completely, or if it was just changed and you need to have the snippet & cached page removed. 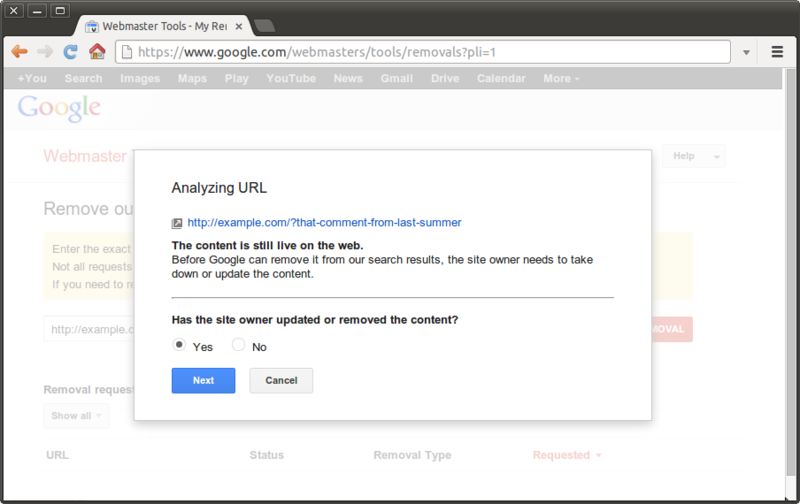 If you're the webmaster of the site, then using the Webmaster Tools URL removal feature is faster & easier. Enter the URL of the page. As before, this needs to be the exact URL as indexed in our search results. Here's how to find the URL. The analysis tool will confirm that the page is gone. Confirm the request to complete the submission. If the page wasn't removed, you can also use this tool to let us know that a text on a page (such as a name) has been removed or changed. It'll remove the snippet & cached page in Google's search results until our systems have been able to reprocess the page completely (it won't affect title or ranking). In addition to the page's URL, you'll need at least one word that used to be on the page but is now removed. You can learn more about cache removals in our Help Center. Enter the URL of the page which has changed. This needs to be the exact URL as indexed in our search results. Here's how to find the URL. Confirm that the page has been updated or removed, and confirm that the cache & snippet are outdated (do not match the current content). Now, enter a word that no longer appears on the live page, but which is still visible in the cache or snippet. See our previous blog post on removals for more details. You can find out more about URL removals in our Help Center, as well as in our earlier blog posts on removing URLs & directories, removing & updating cached content, removing content you don't own, and tracking requests + what not to remove. We hope these changes make it easier for you to submit removal requests! We welcome your feedback in our removals help forum category, where other users may also be able to help with more complicated removal issues. Some smartphone-optimized websites are misconfigured in that they don't show searchers the information they were seeking. For example, smartphone users are shown an error page or get redirected to an irrelevant page, but desktop users are shown the content they wanted. Some of these problems, detected by Googlebot as crawl errors, significantly hurt your website's user experience and are the basis of some of our recently-announced ranking changes for smartphone search results. Starting today, you can use the expanded Crawl Errors feature in Webmaster Tools to help identify pages on your sites that show these types of problems. We're introducing a new Smartphone errors tab where we share pages we've identified with errors only found with Googlebot for smartphones. Not found errors and soft 404s: A page can show a "not found" message to Googlebot, either by returning an HTTP 404 status code or when the page is detected as a soft error page. 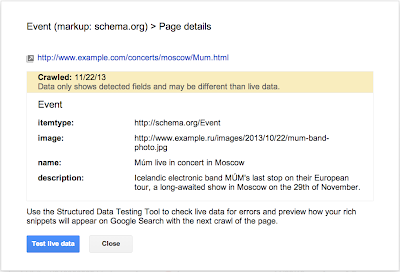 Blocked URLs: A blocked URL is when the site's robots.txt explicitly disallows crawling by Googlebot for smartphones. Typically, such smartphone-specific robots.txt disallow directives are erroneous. 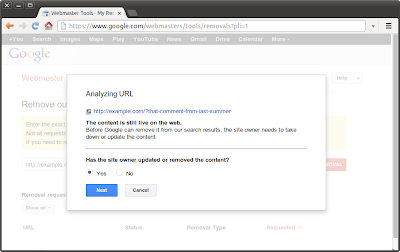 You should investigate your server configuration if you see blocked URLs reported in Webmaster Tools.